Many of us were introduced to tea by way of the teabag. Eventually we branched out to try different types of tea, many of which were only available in loose leaf form. At that point we found ourselves graduating from the teabag to the teapot. Maybe you've had the same experience. First, let's clarify some regularly confused terminology. Many people interchange the terms tea kettle and teapot. Although they share some of the same features including a cover, spout, and handle, that's where the similarity ends. A tea kettle, or simply a kettle, is a utilitarian vessel used to heat water for a wide variety of purposes—making coffee, tea, soup, gelatin, etc. On the other hand, a teapot has only one purpose: to brew tea. Besides its handle, spout, and lid, the teapot can also have other distinguishing characteristics. A strainer is frequently inside the teapot at the base of the spout. The strainer can be built into the ceramic surface with a pattern of small holes, allowing the water to pour through but keeping the tea leaves in the pot. Or it can be made of a swatch of stainless steel mesh that's attached to the pot's inside surface. A teapot with a strainer is very convenient when using loose leaf tea because it keeps the leaves out of your cup. Interestingly, the built-in strainer predates the invention of tea by a lot of years. One of my references (published in 1935) shows an earthenware pot found in Palestine from about 1300 BC with small holes at the base of the spout that presumably were used for straining a liquid. It's quite possible something of this design has been excavated since then that's even older! Another option is that the teapot will come equipped with an infuser. Similar in purpose to that of a strainer, an infuser is a removable basket with holes that fits down into the teapot and holds tea leaves for brewing. It's removed at the end of brewing to keep the tea from becoming bitter. Part of this teapot's convenience is that when you remove the infuser, you also remove the leaves, making the pot easy to clean. Although I prefer teapots with either an infuser or strainer, there is nothing inherently wrong with a teapot lacking these features. You'll just need to use a strainer or infuser to catch the tea leaves when pouring (see Tea Infusers and Strainers). When using teapots like this, be sure to pour any tea left in the pot into another vessel after brewing in order to keep it from getting bitter. Using a teapot has the added advantage of giving the tea leaves enough space to open fully and release their flavors. Ultimately, this results in a more flavorful cup of tea. One of the other reasons I prefer using a teapot (whether I'm brewing one or many cups of tea) is because it has a lid. The tea is covered while steeping and retains all its flavors and aromas. The lid also keeps the water at a more even temperature, resulting in a hotter cup of tea. Teapots originated in China and have evolved in each different culture where tea was adopted. Depending upon the time and place (and sometimes associated customs, traditions, and politics) different materials and colors were used, and designs were restrained or freestyle. Today there are as many teapot styles as one can imagine, making the teapot a fun collector’s item. This may be oversimplifying, but I break teapots into two categories: Asian style teapots and European style teapots. I also refer to these as eastern and western style, respectively. Asian style teapots tend to be small. Traditionally, Chinese teapots were made to brew single servings of tea, and this trait is often retained in eastern teapots. However, they can also be found in a variety of sizes and shapes, and either plain or decorative. This photo shows a range of Asian teapots in my collection. Asian teapots are often associated with tea-drinking customs and rituals, and their beautiful simplicity reflects the importance of the ceremony. But keep in mind that porcelain and porcelain teaware was invented in China, so the region also has a strong tradition using that material in both painted and unadorned forms. Europeans first drank tea out of Chinese porcelain. When they eventually learned to make porcelain themselves, they let their imaginations run wild. Because tea drinking was originally reserved for the upper class in Europe, teapot designers weren't shy about extensive and expensive ornamentation. European style teapots tend to be larger because of the social aspects traditionally attached to tea-drinking in Europe. Multiple cups can be brewed at one time in these pots. However, they also can be found in just about every shape and size. They can be plain, charming, fancy, elegant, or silly. The photo below shows a few European teapots in my collection. Asian style teapots can be very rustic or very elegant depending upon their function. I was reading a book recently about a woman invited to participate in a Japanese tea ceremony at a friend’s house. The teapot used in the ceremony was very rustic and plain, and the author described it as ugly, even hideous. Asking her friend later why her mother didn’t use her more elegant wares, she was told it was because the tea ceremony was meant to focus on simplicity, elevating the beauty of nature and rejecting anything artificial such as decorated porcelain. So the teapot and cups were simple, fairly rough, and without decoration. This probably illustrates the biggest difference between western and eastern style teapots. Although the end result is brewed tea, there is often more meaning attached to eastern teapots. Tea ceremonies are an important part of the culture in most parts of Asia, and the teapot and tea accessories are important components of the ceremony. Finally, referring to teapots as being Asian or European style is admittedly a generalization. 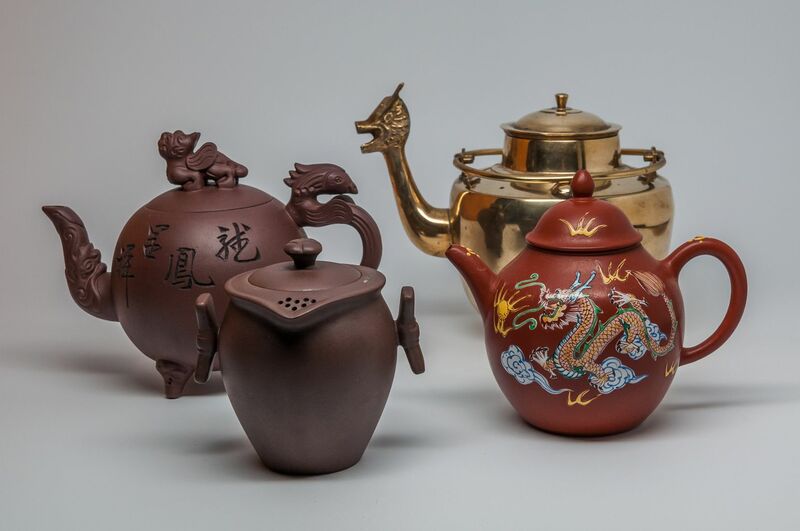 But over the years each country has come to have its own traditional style(s) so that within the eastern style, Chinese teapots have different characteristics than those from Japan or Korea. Similarly, English, German, and Russian teapots are each unique among western style teapots. Just as the teapot styles can vary enormously, so can the materials used to make them. Ceramic is most commonly used for making teapots. Porcelain is particularly common for European style teapots. 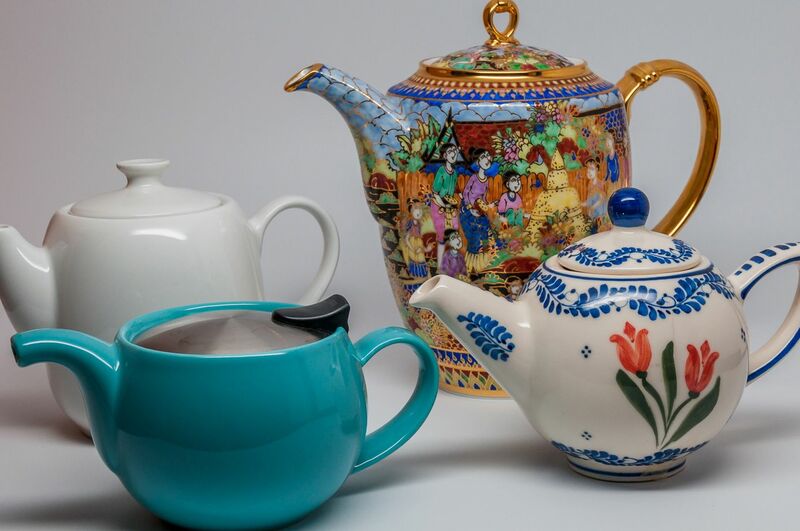 Beyond ceramic, you’ll find teapots made from a wide variety of materials including glass, cast iron, stainless steel, enamel, brass, tin, silver, copper, and just about any other material that will hold hot tea. 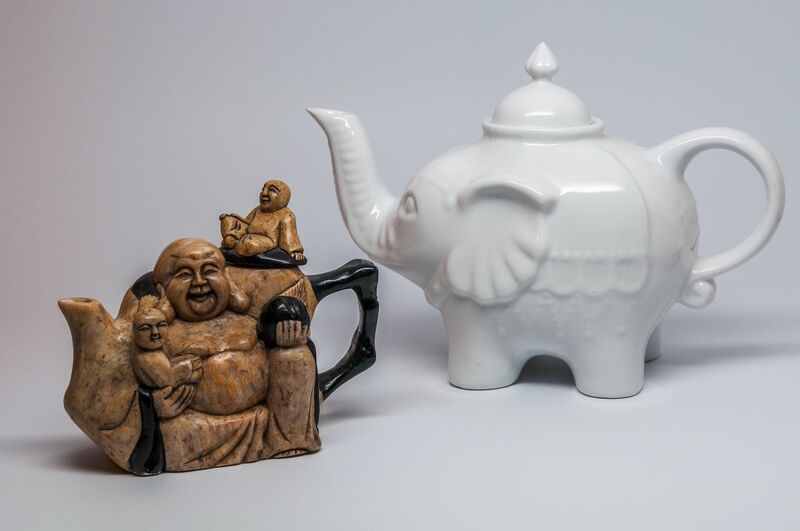 One of the reasons that glazed porcelain is a favorite material for teapots is that non-porous materials are best when using the same teapot to make different types of tea. They can be thoroughly cleaned between uses so that the taste of an earlier brewed pot won't interfere with the taste of subsequent pots. Many Asian style teapots are unglazed and porous. Over time, the teapot acquires flavors that are transferred to future brews. As a result, you will want to reserve a porous teapot for a specific type of tea. For example, I have one small teapot for brewing green tea, and a different small teapot for brewing pu-erh. The story goes that after using an unglazed teapot for many years, it will have absorbed so much of the tea's essences that it's possible to brew a pot without any leaves. The teapot you choose will depend upon your preferences and needs. Do you plan to use it for yourself, or do you expect to use it to brew tea for a group? Is your style casual or formal? Do you always drink the same kind of tea or do you experiment with a variety? If at all possible, try out your teapot before buying. Evaluate it for comfort, weight, whether it drips, and its design. If considering a large teapot, remember that once it’s filled with water it will be quite heavy. Try to gauge the extra weight, and whether it will be manageable for pouring when filled with hot tea. Teapots can sometimes drip from the spout. Of course, this will be difficult to evaluate in a store, but look for a small hole in the lid or a loose fitting lid. Either of these features will allow air to enter and help minimize or eliminate drips. And finally, evaluate the teapot for looks. You might notice that my collection has a strong dragon theme. I didn’t do this consciously, but apparently I find dragons appealing. Remember, there's nothing wrong with having more than one teapot, so don’t over-analyze it. Find one you like that will work for your needs now. You can always add another one later.